What power is measured by a spectrum analyzer? Is the signal level that is shown in a spectrum analyzer power of the signal being measured. If yes then what power is it: average power, true power or peak power? 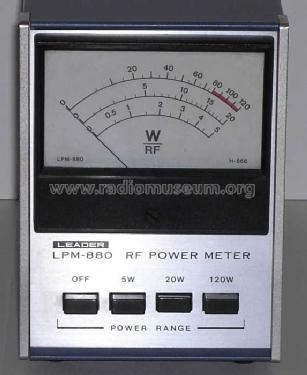 Also when using a power meter for measurement of power, what is difference in its measurement of power with respect to that of a spectrum analyzer? I mean, what is the requirement of a power meter if a spectrum analyzer is capable of measuring the power itself (assuming same level of signal being measured by both)? Typically, a spectrum analyser (SA) cannot be classified as a true power meter, because it is intended to display the IF envelope voltage. Power can be derived then assuming a 50 Ohm reference impedance. (Some SAs offer to choose among less frequent reference impedances for instance of 75 Ohm). Modern SAs however include a power detector circuitry for accurate power readings. The detector mode setting enables several measurement options such as RMS power or peak power... If the trace is set to (power) detector mode, and the latter is for instance set to RMS, it is possible to use this info to obtain a more or less reliable RMS power reading! The SA marker indicates the total power (on the vertical axis) contained within the frequency band set by the resolution bandwidth (RBW) filter, and centered around the selected marker's frequency (horizontal axis). The power reading is usually expressed in dBm unit. Example: If the RBW is set to 10 kHz and the marker reading is say -6dBm at 1.95GHz, it means that -6dBm/10kHz with the 10kHz centred around 1.95 GHz. Ho much power in 10kHz when expressed in mW? Assuming that this level is uniform over 3.84MHz, how much in 3.84MHz? If you know your signal is only located in this band, (in the example above that corresponds to one UMTS channel), it is possible then to calculate the power that corresponds to that band. Some SAs include the ability to automatically perform the power reading of a desired band (e.g. 3.84MHz) by integrating the readings of the RBW filters over that band. This should lead to the same answer above. In both cases, the power/Hz (power carried by exactly one 1Hz e.g. at exactly 1.95GHz) can be derived as well. The power meter (PM) is an instrument dedicated for power measurements. Theoretically, a signal's power could be measured at highest accuracy using a PM. No integration is required since the PM has a very low frequency selectivity (i.e. has a wideband nature). Roughly speaking, the power reading thus corresponds to "everything being fed" to the PMs probe. If only the desired signal is present at its input, this results in a very accurate reading. However if there's an "interferer" along, or if one is interested in the power reading carried by a certain frequency band, then this constitutes a drawback for the PM. An example is that a PM is not suitable for measuring adjacent channel power (in communication signals) as an absolute value or relative to the transmit channel power. The power in the adjacent channels can only be measured with a "selective" power meter. The SA is the solution in this case. In other words it's going to be a lot cheaper than some spectrum analyzers. It comes down to cost I guess. Both measure (as a fundamental basic requirement) average power i.e. volts x amps. No different mathematically to how your electricity meter does it and if power factor reduces from unity then the power goes down - it's called power factor on AC power measurements and this usually/ultimately translates to "poor impedance matching" or high "VSWR" in RF circles but, fundamentally the same process and math is at work. Average power = true power = power. Either of these names implies volts x amps to me. When it comes to both the RF power meter and spectrum analyzer, there will be bandwidth limitations that reduce the power reading to a smaller part of the spectrum. Clearly on a spectrum analyzer this is all part of it being able to distinguish spectrally what frequencies are being received. Q. Is the signal level that is shown in a spectrum analyzer power of the signal being measured. If yes then what power is it: average power, true power or peak power? A. It shows signal power at connector input, any decent spectrum analyzer have settings to show average and peak power. To show true power it has functions to deduct cable loss to reflect true power. Q. Also when using a power meter for measurement of power, what is difference in its measurement of power with respect to that of a spectrum analyzer? I mean, what is the requirement of a power meter if a spectrum analyzer is capable of measuring the power itself (assuming same level of signal being measured by both)? A. A power meter is utilized to measure power higher than 0 dBm (1 milliwatt) so as not to utilize an expensive spectrum analyzer just to measure power and the frequency is already known. A spectrum analyzer is useful when frequencies are unknown or multiple frequencies are being measured and the power is below 0 dBm (1 milliwatt). They overlap capabilities, so your measurement objectives and quantity has to be determined first before you can decide which instrument to utilize for the measurement. Not the answer you're looking for? Browse other questions tagged power rf antenna radio spectrum-analyzer or ask your own question. Accurately measure relative intensity noise (RIN) using RF spectral analyzer? What is the difference between peak-power, average power and true RMS power in RF measurement? What does the attenuation setting do in an RF spectrum analyzer? What is difference between channel power and normal power plotted by a spectrum analyzer? Spectrum Analyzer vs. RF Power Meter? Impact of “reference level” and “RBW” on the time domain signal in spectrum analyzer?